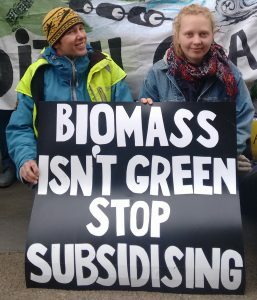 Around £1 billion a year of bill payers’ money a year is being spent on inefficient biomass technology that damages forests and biodiversity, pollutes communities at home and in biomass sourcing countries, and makes climate change worse. This is money which should be going towards genuinely low carbon clean renewable energy instead, i.e. wind, wave and solar power. 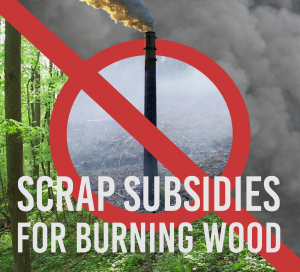 The government has just effectively ruled out future subsidy for large-scale biomass. This sends a strong message that biomass is no longer considered part of the solution to climate change. We are calling on the government to extend this logic by removing existing subsidies awarded under the previous Renewable Obligation Certificate (ROCs) scheme. The UK burns more imported wood for electricity every year than all the wood that the UK produces annually. In 2017, Drax Power Station alone burned pellets made from 13.6 million tonnes of imported wood, whereas total UK wood production was less than 11 million tonnes. Much of this is wood from the clear-cutting of carbon-rich, biodiverse native forests in the southern USA. Despite emitting at least as much carbon as coal, this counts towards our legally binding renewable energy targets and is generously subsidised from a levy on electricity bills. In 2017, biomass subsidy was around £1 billion and we expect this figure to increase further by 2020 as two large new biomass power stations are expected to come online. 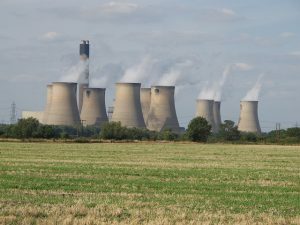 In 2017, Drax Power Station in Yorkshire (the world’s largest biomass burner) received £729 million of bill payers’ money – around £2 million every day. Burning this wood emitted 11.8 million tonnes of carbon dioxide, more per unit of energy than from burning coal and more than the annual carbon reduction for the whole UK as required in the 4th and 5th Carbon Budgets. Yet Drax does not have to declare those emissions or pay carbon tax on them (thereby avoiding £270 million in tax which would have been payable had it burned coal). Biofuelwatch calls on the government to remove funding for biomass under the Renewable Obligation Certificate (ROCs) scheme. The money removed from biomass subsidies must remain part of the Levy Control Framework and lead to increased subsidies (Contracts for Difference) which we believe must benefit wind, solar and wave power. Letter from 800 scientist to the EU Parliament during the negotiation of the new Renewable Energy Directive. Under the Renewables Obligation, energy companies receive subsidies called Renewable Obligation Certificates or ROCs for every unit of electricity they produce from an eligible technology. The Renewable Obligation was phased out between 2014 and 2017. However, schemes which received ROCs before then can continue to receive them until 2027. Since 2014, new renewable electricity schemes have been allowed to compete for Contracts for Difference. Total ROCs for woody biomass in 2017 were almost £800 million, of which Drax power station received £481 million (in addition to £248 million from a Contract for Difference). Since then, the government has amended the rules for new Contracts for Difference (CfDs) to ensure that biomass plants can only attract a CfD if they operate as combined heat and power plants with an overall efficiency of at least 70%. Moreover, new CfDs will not support biomass electricity which does not meet a strict greenhouse gas limit. This rules out burning imported wood pellets due to the fossil fuel emissions for transport. No existing biomass burning power station meets those two criteria. This decisions sends a strong message from the country that pioneered the subsidising of biomass that it is no longer considered to be part of the solution to our energy needs. Yet £1 billion and rising in existing biomass subsidies continue to be paid. Under both the ROCs and the CfD schemes, receipt of subsidy is conditional upon operators meeting the ‘Biomass sustainability and greenhouse gas standards’ written into the Renewable Obligation Order 2015. However, standards cannot address the indirect impacts of a new wood demand which far exceeds the amount of wood the UK produces. Furthermore, the standards are flawed and weak. The industry self-reports and there is no remit or budget to police or enforce the standards. The greenhouse gas standard enshrines the fallacy that biomass is of itself carbon neutral, requiring only the fossil fuel carbon emitted during harvest, processing and transport of the pellets to be accounted for. 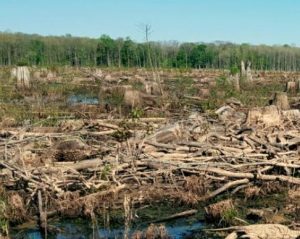 There is overwhelming evidence that biomass deemed to be ‘sustainable’ under the regulations, and thus subsidised by the public, is damaging forests and biodiversity and making climate change worse. How and when could the subsidies be revoked and what would this mean for wind, solar and wave subsidies? Existing ROCs subsidies can be revoked by amending the Renewable Obligation Order 2015. This would be done through secondary legislation, not requiring parliamentary time. Biofuelwatch believes that there are no legal obstacles to removing ROCs from biomass power stations. In 2015, the government used secondary legislation to remove another subsidy from all renewable electricity generation: an exemption from the Climate Change Levy. Drax challenged this decision, first in the High Court and then in the Court of Appeal and lost both times. 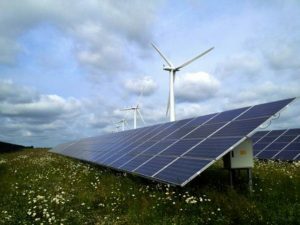 The Government has made a fixed amount of money available annually for renewable electricity subsidies, called the Levy Control Framework. Therefore, if ROCs are removed from biomass, the money saved must and should remain within the overall pot of funding available for other technologies and be spent through increased CfDs. Onshore wind and solar power are not currently eligible for CfDs and wave power projects are not able to compete effectively for these subsidies. Biofuelwatch deeply regrets these rules and supports calls to allow these three renewable technologies to benefit from the CfD subsidies. However, CfDs have been playing an important role in helping to expand the UK’s offshore wind generation and additional funding currently spent on biomass would accelerate this expansion. Meeting the goal of the Paris Agreement to prevent more than 1.5 degrees of warming requires a rapid shift from high-carbon to low-carbon energy as well as reducing energy use. It also requires forests worldwide to be protected and expanded. To help meet this goal, the UK must restrict subsidies to the lowest carbon forms of renewable energy. 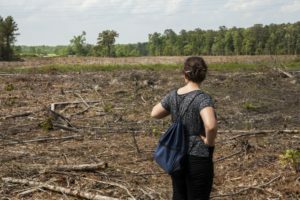 Shifting subsidies from biomass electricity to lower carbon renewable power would help achieve this aim and, furthermore, it would reduce pressures on forests in the southern US and other regions, thus helping to stem forest degradation. Read a longer, also fully referenced briefing on Biomass subsidies and impacts here.